Kyle WalkerNew York, by education levels. You may not know your neighbours by name, but you can at least know them by education level. 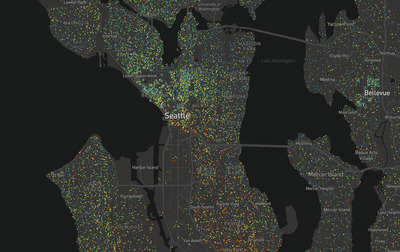 Kyle Walker, an assistant professor of geography at Texas Christian University, has created an interactive dot map visualising US neighbourhoods by educational attainment. Each dot represents between 25-500 people over the age of 25, and each is colour-coded based on how far those people have gone in school. 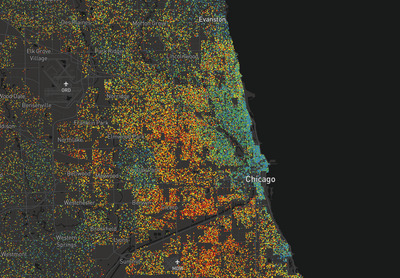 Blue dots are graduate degrees, green are bachelor’s, yellow are some college, orange are high school, and red is everything short of high school. Here’s how the maps shake out in various cities across the US. The San Francisco Bay Area is marked by high levels of education in Berkeley gradually shifting to less education further south in Oakland. Across the Bay, San Francisco is made up largely of graduate degrees -- except for a pocket of red in Chinatown. Chicago gets more educated the further you move toward Lake Michigan, with the greatest concentration of graduate-degree holders living in the South Loop neighbourhood. Like LA, the city has clear divisions between neighbourhoods. Phoenix has a fairly mixed population toward the city center, save for the neighbourhoods immediately west of downtown. The most educated residents collect in the exurbs of Scottsdale and Tempe.